1. Your new movie, Mowgli, opens Oct. 19. You directed it, and you play Baloo. How did you stay healthy while filming? I try to not drink when I’m filming. It really does help clear your mind and sharpen your senses. I go through periods leading up to production where I try to get healthier. I actually look forward to the rigor. The big trick is to do everything in moderation, but I’m a bit of an all-or-nothing person. 2. Do you work out? I’ll do press-ups, sit-ups, all of that, but I’m not a weight-lifting person. I’m really not a gym person. I’m an outdoor junkie. I absolutely crave wilderness. I used to do a lot of climbing in my youth -- hill walking and trekking. I cycle to work quite a lot. We, as a family, go for walks in the nearby hills. 3. Why did you stop climbing? When you have a family, you start to become aware of your responsibilities. I do love being in mountain environments, but I don’t do the hard-core soloing and ice climbing as much as I did -- although I’m probably sort of yearning to do it again in a secret way. 4. You have three kids: Ruby, 19; Sonny, 17; and Louis, 13. What did you learn from being a parent? As a human being, it’s taught me everything. It’s taught me that you need to create an atmosphere where everyone is valued and everyone feels they can function to the best of their ability. I learned that by observing my wife, Lorraine, who is brilliant at it. 5. What’s your best health habit? I try to keep off sugar, which is hard. As a family, we try to eat healthily. We make a lot of juices -- beet, carrot, orange. We eat a lot of avocado, a lot of quinoa. I’d been a vegetarian since I was 18, then I started eating fish when I was about 30. We were shooting Lord of the Rings, and I needed more protein. But I haven’t eaten meat since I was 18. 7. Do you sleep well? I’m a terrible sleeper. I literally get about 4 hours of sleep. I can feel very sluggish during the day, but I have 10-minute power naps and feel fully recharged. My friends will tell you that I can easily drop off to sleep. I can literally be in a conversation and nod off. [At night] I know you shouldn’t bring your phone into the bedroom and your laptop into bed, but I’m ridiculously undisciplined when it comes to that. I’ll tell you what: I’m at my most creative between 5 and 6 in the morning. That’s generally when I have my best ideas. 8. You do fundraising and advocacy for Best Beginnings, which helps children at risk by supporting their physical, emotional, and language development, and Barnardo’s, which helps children exposed to poverty, sexual exploitation, disability, and domestic violence. Why is helping children important to you? I’m passionate about children having an equal start in life. I look at my children, how lucky they are, and I feel obligated in some small way to help others have as solid a start as they possibly can. 9. Is the best part of life behind you or in front of you? Oh, wow. I always think it’s ahead of me because change is good. I’m excited about the next generation, where my children are going, and what they’re going to be doing. I’m always equally excited about the next film I’m going to direct or the next character that I’m going to take on. I’m constantly changing, and I learn so much from the different experiences I have. 10. Is there a secret to a good, healthy life? I think it’s absolutely all about really living in the moment, being present. When work is demanding so much of you, being with people that you love being with and to be present is the most important thing. 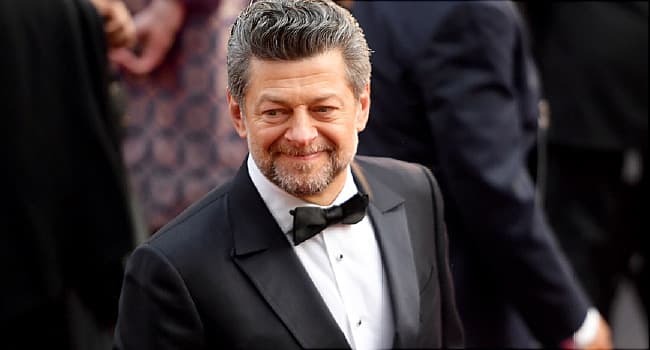 Andy Serkis, interview, July 2018.